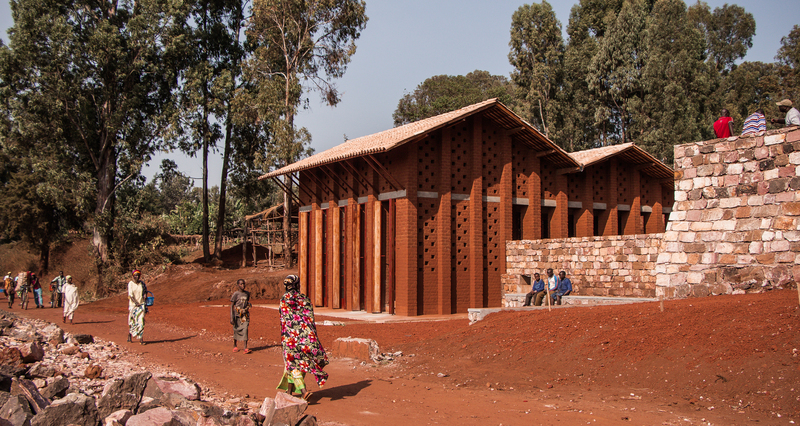 The library for the community of Muyinga, is the first stage of a future inclusive school for deaf children designed by belgian practice BC Architects & Study (Belgian Cooperation) with the spirit of mutual learning and collaboration between the community, the architects and architecture students, amongst others. The architects saw the limited resources for this project as an opportunity rather than a hindrance. They managed to achieve a short supply-chain of building materials and labor force, important in supporting the local economy, and installing pride in the construction process. The key concepts adopted by the architects for this project are: social integration, reinterpretation of the vernacular, participatory processes, and short-chain economy. Burundian culture relies heavily on oral tradition. In such a context deaf children are excluded from stories, information, exchange, and education. 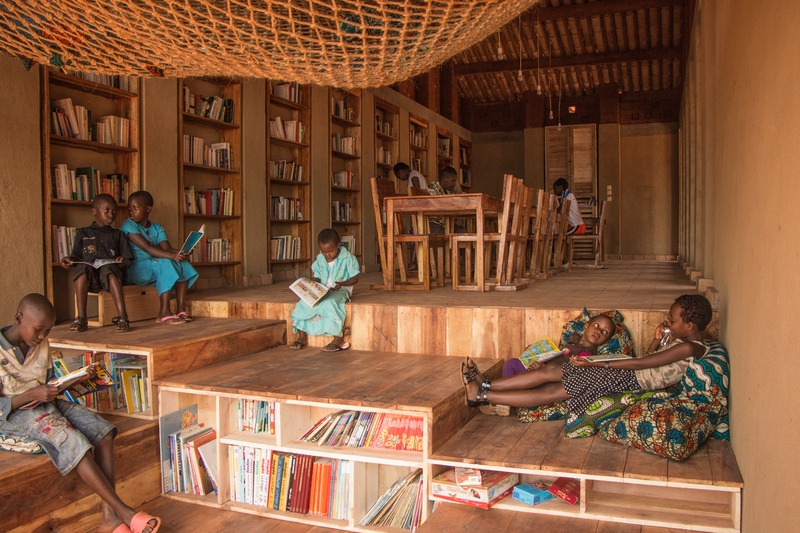 The library of Muyinga, linked to an inclusive boarding school for deaf children, creates the possibility for these children to belong to a group, and the wider community of Muyinga. 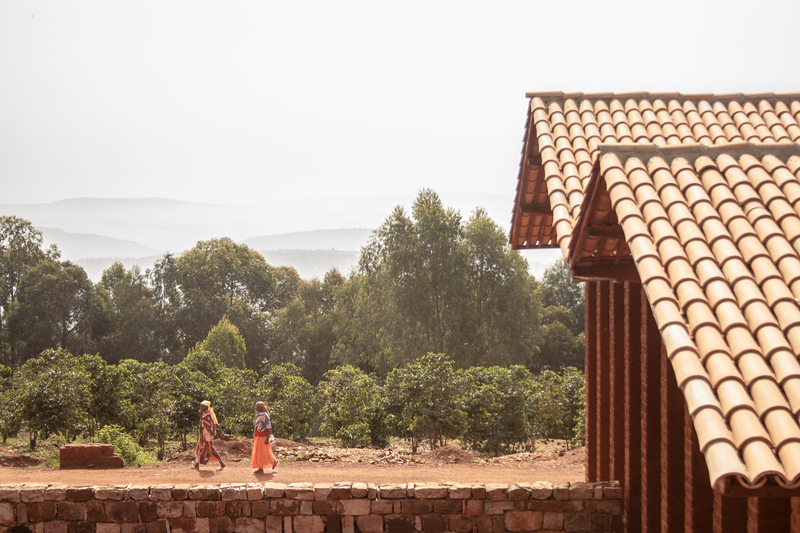 In a later stage, the school will further integrate its deaf students into broader society by a school-based wood workshop, and a polyvalent hall, both serving the wider community of Muyinga. 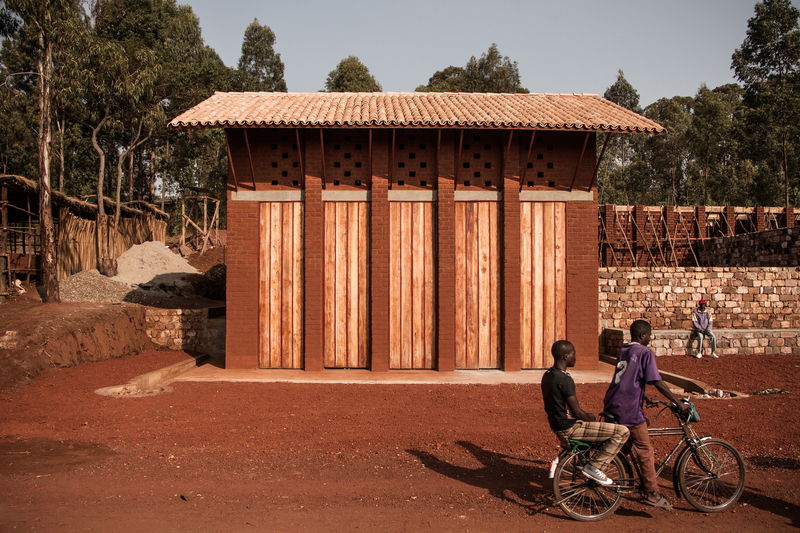 Over two months of fieldwork, studying vernacular architectural practices in Burundi, provided insight into the local materials, techniques and building typologies. 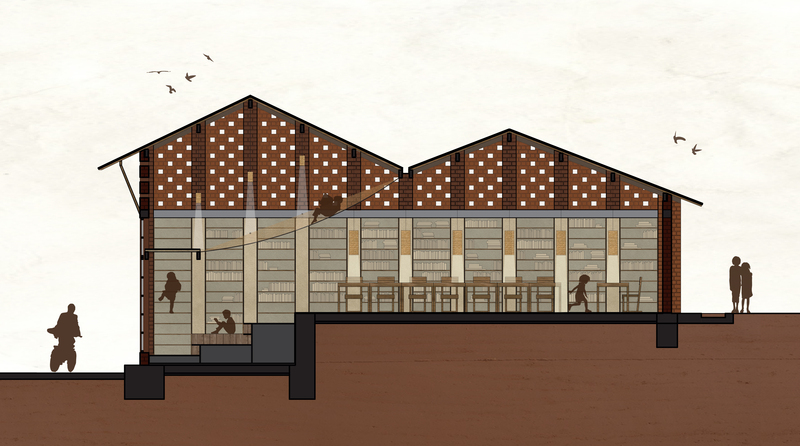 These were then applied, updated, reinterpreted and framed within the local know-how and traditions of Muyinga. Earth, ‘the poor peoples material’ is the primary material used. 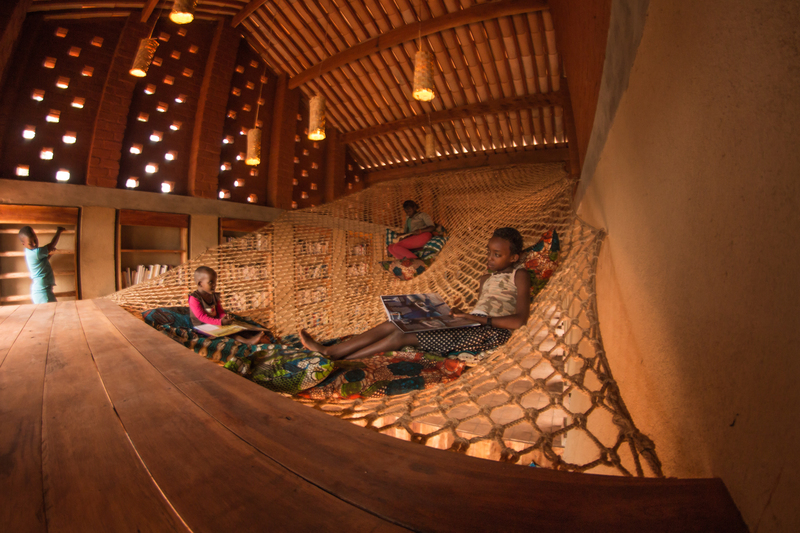 The library is organized along a longitudinal covered circulation space, or “hallway porch”, a space often encountered within the Burundian traditional housing to provide shelter from heavy rains and harsh sun. Life happens mostly in this hallway porch; encounters, resting, conversation, waiting, encouraging community relations. 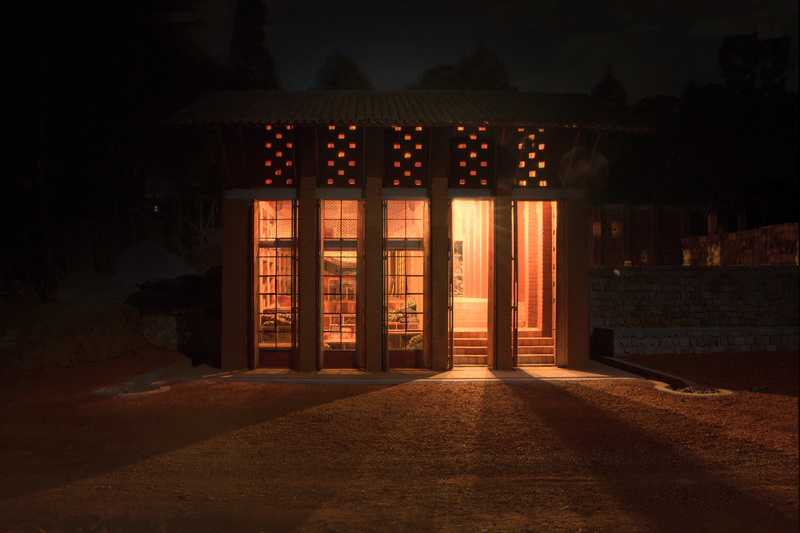 Transparent doors between the columns create the interaction between inside space and porch. 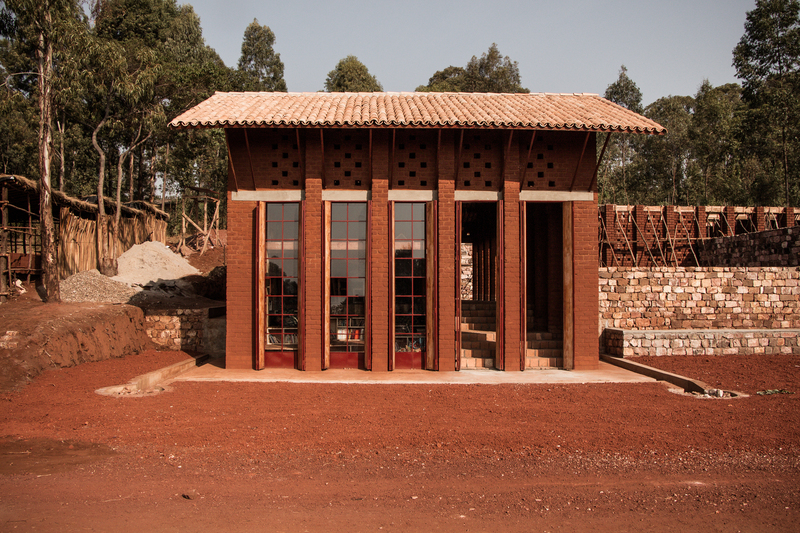 Fully opened, these doors make the library open up towards the adjacent square with stunning views over Burundi’s “milles collines” (1000 hills). On the longitudinal end, the hallway porch flows onto the street, where blinders control access. On the other end, the hallway porch will continue as the main circulation and access space for the future school. 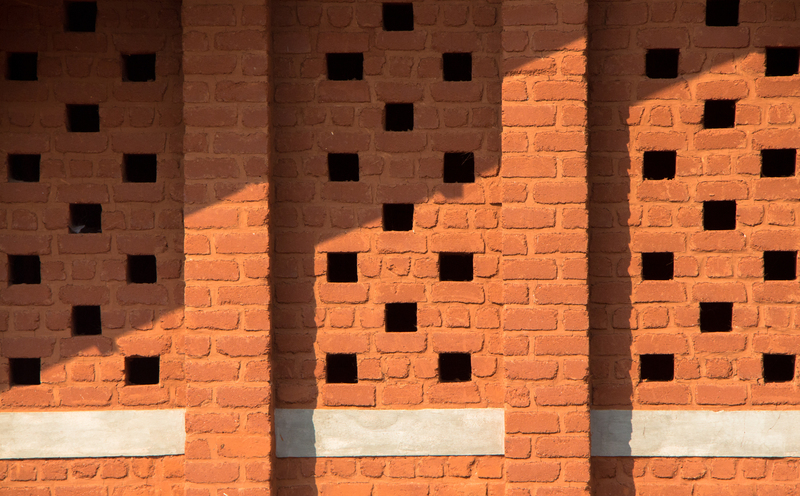 A very important element in Burundian architecture is the demarcation of property lines. It is a tradition that goes back to tribal practices of compounding family settlements. 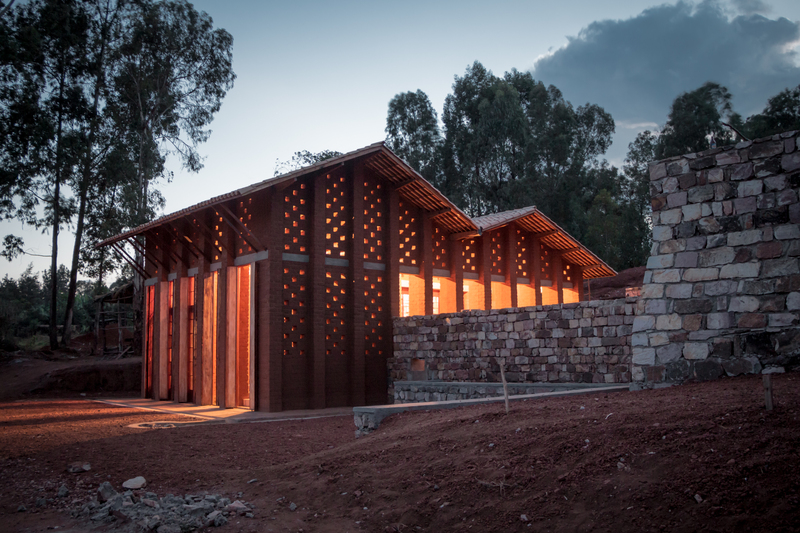 For the library of Muyinga, the wall facilitates the terracing of the slope as a retaining wall in dry stone technique, low on the squares and playground of the school side, high on the street side. Maintaining the view towards the valley, as well as safety from the street side. 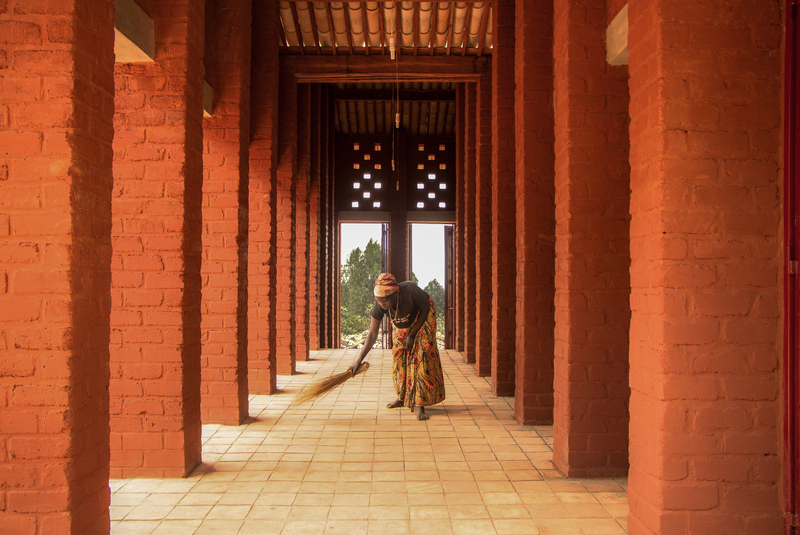 The general form of the library is the result of a structural logic, derived on one hand from the material choice (Compressed Earth Blocks masonry and baked clay roof tiles). 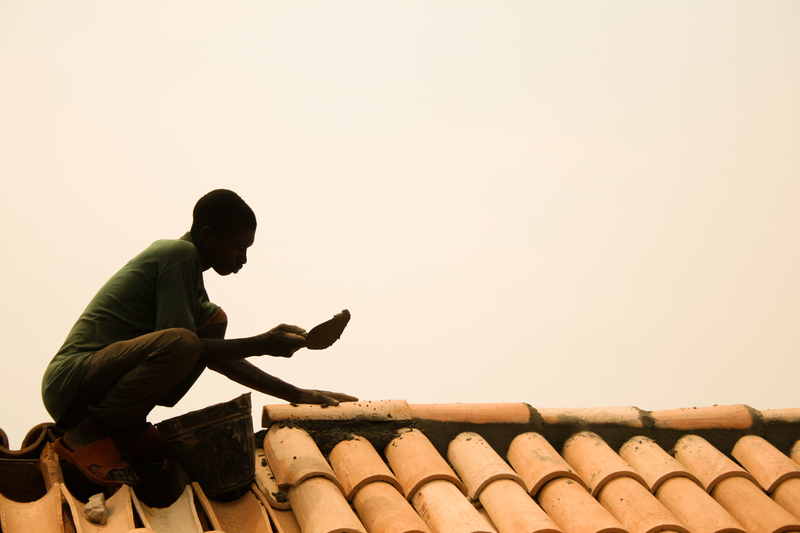 The locally produced roof tiles were considerably more heavy than imported corrugated iron sheets. This inspired the structural system of closely spaced columns, also acting as buttresses for the high walls of the library. This rhythmic repetition of columns is a recognizable feature of the building, on the outside as well as on the inside. Climatic control is achieved with a high interior with continuous cross-ventilation helping to guide the humid and hot air away. The façade is perforated according to the rhythm of the Compressed Earth Blocks (CEB) masonry, giving the library its luminosity in the evening. The most seductive area of the library is the double height room at the street side. Here a special space for the smallest of the library readers has been achieved. This children’s space consist of a wooden sitting corner on the ground floor, which might facilitate cosy class readings. 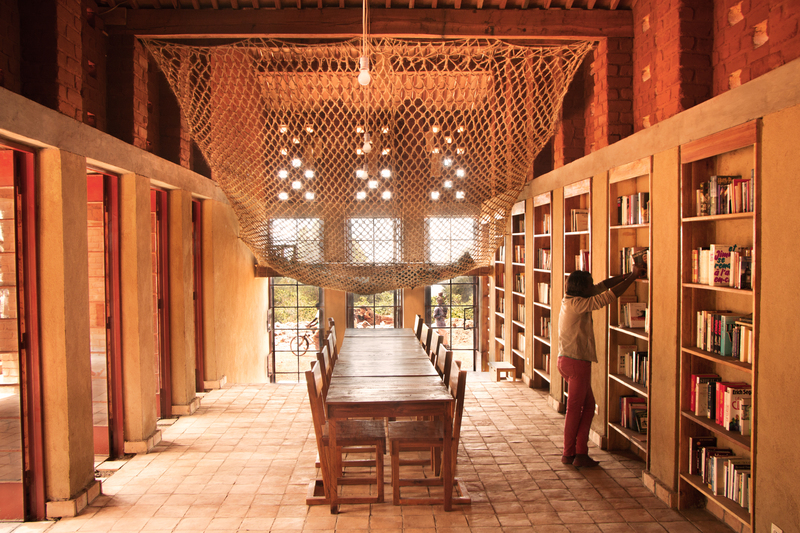 Hanging above it is an enormous hammock of sisal rope as a mezzanine, in which the children can dream away with the books that they are reading. Participatory processes and education: BC architects & studies has focused from the beginning on the implementation of participatory processes in the construction practice. This was achieved not only by cooperating with local workforces, but also by involving students, interns and young architects, in a mutual multidirectional educational setting (students from LUCA architecture school, Brussels and Zevenkerken High School participated at different levels). The organisation of the library is also based on this principle. The board of the library includes all directors of neighbouring primary and secondary schools, facilitating contact and cooperation between the future deaf students and the hearing students. The library will also host cinema-nights for the whole community of Muyinga. “All material research, design decisions and construction site organisation aims at keeping a short supply chain of expertise, labour, and materials. We try to reinforce the local economy by means of this short supply chain. We chose hand labour over machine labour when organizing earthworks; we hire only local labourers, a local foreman and local architect, to avoid the interference of a contractor from Bujumbura or Rwanda; we focus on the use of local materials such as earth for the masonry and finishing, clay for the roof and floor tiles, sisal for the hammock, Eucalyptus for the roof structure, and if we have to use cement, we try to do it as minimal as possible, wile buying it in the local shop. Throughout the process of the construction, we try to create good conditions for knowledge transfer. 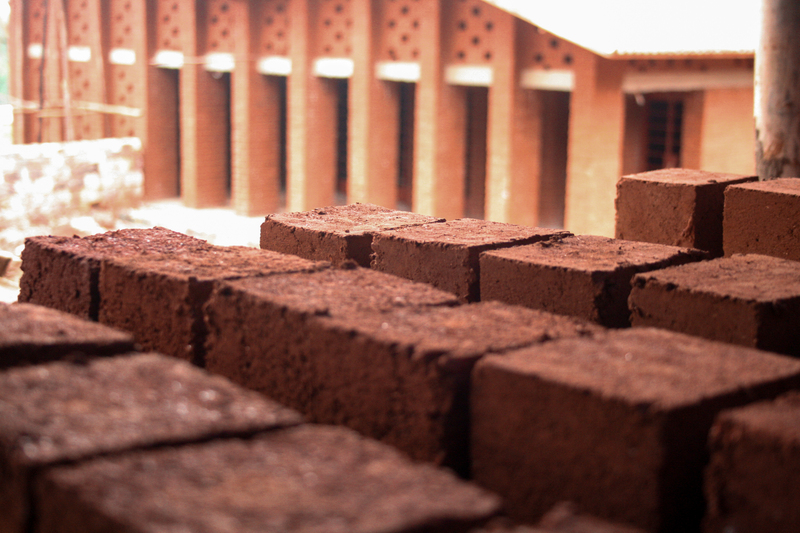 The builders have mastered CEB production and construction, earth plaster through our input. We have mastered the sisal hammock weaving and the floor and roof tiles detailing through the input of the local builders, and so on. The knowledge transfer goes in all directions. Update on the second stage of the project here. Truly elegant! 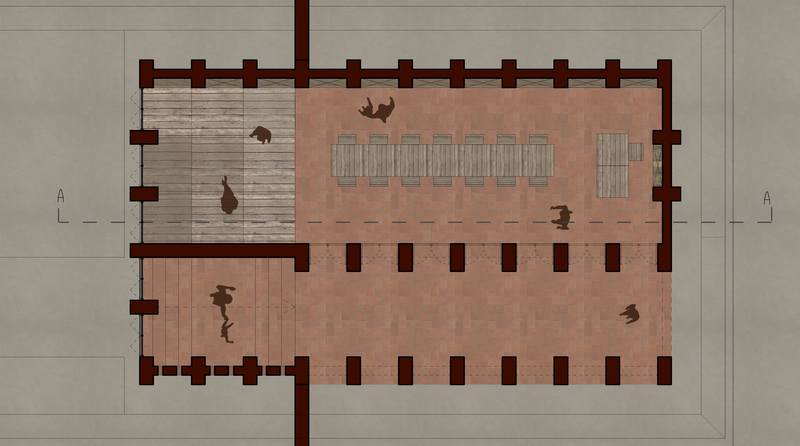 From plan to each detail, quite wonderful.